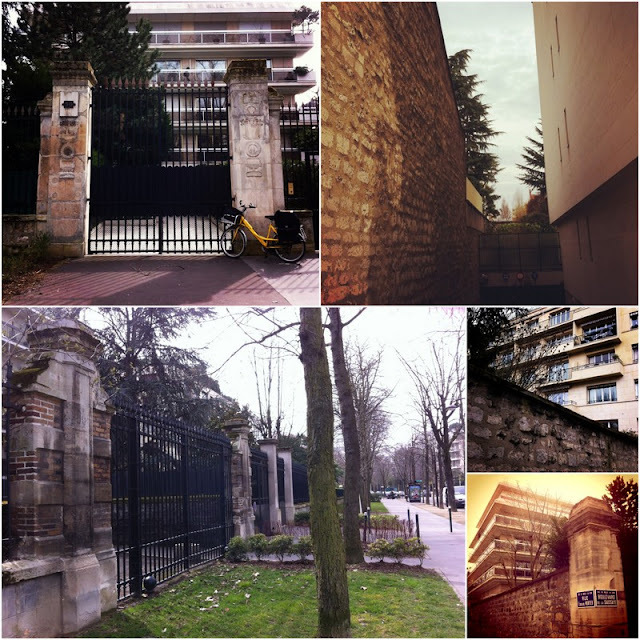 Although officially the richest town in France*, Neuilly-sur-Seine is built within a landscape of ruins. In search of these vestiges of destruction amongst the modern-day architecture of affluence. Running north to south through the heart of Neuilly, a town that touches Paris's western edges, is the Boulevard du Château. Although difficult to track down today, the chateau this road refers to once occupied 170 hectares of land and dominated the river beneath. After wandering aimlessly around the somewhat sterilised streets of the town, I eventually find the remains of the building, not on the Boulevard or Rue du Château, but on the corner of the Boulevard de la Saussaye and the Boulevard d'Argenson. It is this name that should have been the clue. The Comte d'Argenson was Louis XV's State Secretary for War, and the man who had the impressive chateau built in 1751. The life of his building though was not a long one. During the 1848 revolution in France it was pillaged and burned to the ground. There are no romantic ruins on the site today, no memorial to the violence of past revolutions. Instead, one wing of the old château still stands, but is now the quiet and fenced off home of a Congregation of nuns (the Sœurs Saint-Thomas de Villeneuve). The sustantial lands belonging to the property were confiscated by Napoleon III in 1852 and were cut up into seven 30 metre-wide boulevards and nine 15 metre-wide streets. 700 individual plots were created within this grid and eventually sold in successive auctions from 1854. This layout still defines the town today. These plots were bought by members of the grande et petite bourgeoisie whose more modest properties mushroomed on the liquified lands of the château. Although less grandiose, these houses were still set back from the new roads, surrounded by walls and fronted by imposing gates. Some of these properties still stand today, but most of Neuilly is now a succession of rather banal apartment blocks. The curiousity of Neuilly though is that these were built within the footprint of the previous developments, perhaps even going as far as recycling their foundations. Walking through the streets and boulevards that now criss-cross the old grounds of the chateau it is easy to spot these footprints. The limits of many of the 700 plots are still sketched out by high stone walls, and a large number of crumbling stone gateways are still in place. Sitting at the heart of these modern-day citadels though are anonymous contemporary residences. Although the destruction of the old houses was mostly through choice - demolishing a single house and replacing it with multiple residencies will always bring more profit - other ruins were the result of further political events. The town found itself in the front line during the 1871 Commune, and the bombardments - mostly by the Versaillais troops - destroyed over 500 houses. Rather than a place to settle though, Neuilly has always been more a place of passage. I head up to the Boulevard Bineau, one of ancient routes between Paris and Normandy. Tree-lined, it is still superficially rural in appearence, but acts today as a kind of multi-laned motorway through the town. This street is typical of the cityscape, a town without any central points or places where roads stop and people can gather. The Boulevard Bineau leads to the river Seine and the pont de Courbevoie. For a long time there were no bridges across the Seine in Neuilly. Travellers would need to take a ferry before continuing their trip, an inconvenience that people lived with - until the carriage of Henri IV and Marie de Médicis fell off the ferry in June 1606. After this incident, Henri immediately ordered the construction of a bridge (the Pont de Neuilly)! At the end of the boulevard is an island, the Ile de la Jatte. This is Neuilly's liminal landscape, and as is the case with many such territories, it was also once a place of industry and entertainment. Wealth though has spread onto this island, but a few traces remain of a more popular past. One of these is a modern-day ruin that is destined to shortly disappear. Just off the Boulevard and overlooking the bridge, a rusting, ivy covered hulk is still advertising jazz concerts that took place over six years ago. It looks like a site that was rapidly abandoned, its inhabitants having time just to pick up a few belongings as invaders quickly approached. The only attackers though were the surrounding trees and plants, but this vegetation was quick to take possession of the building. Half-way across the island is another scene of destruction. It is a strange experience to take an online streetview tour of this territory, a community of shops, restaurants and apartment blocks, then to see the levelled grounds today. It's a 'rénovation dans un souci d’animation économique' (renovation to stimulate economic activity) explain the local council, but the future reality of the development seems to be a move from a designless working class environment to a more dateless and monotonous moneyed modernity. At the very edge of the destruction, on the wall of a building allowed to survive the cull, a window into a previous life and out to an imagined reality. This brings to mind another recent (re)development in Neuilly, the Theatre des Sablons which has sprung from the home of another religious community. This multi-use arts centre is currently hosting an exhibition entitled 'L'arbre qui ne meurt jamais' (the tree never dies), a compilation of the works of 40 contemporary artists. 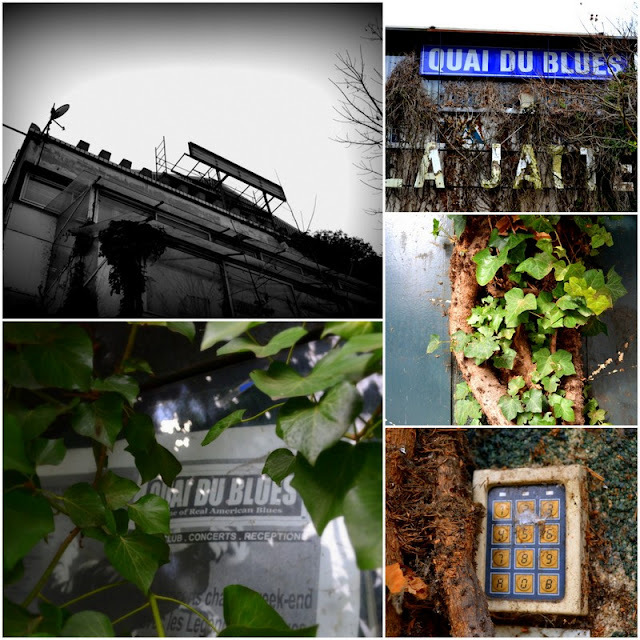 'Quelles que soient les transformations urbaines, l’arbre ne disparait jamais véritablement' (whatever urban transformations there may be, the tree never completely disappears) explain the exhibition organisers. This panorama seems to confirm this sentiment. I turn left on the island, down towards its southernmost point. I'm back now within the grounds of the old château, but this is difficult to imagine with multi-story glass-fronted office blocks on my shoulder. The riverside landscape, a succession of small wharfs, houseboats and old guinguettes (now upmarket restaurants) is more interesting. As the road swings back around the other side of the island, I continue onwards into the Neuilly tennis club. As the island narrows to a point, the tennis courts are lined up lengthways, and in each one there are groups of mature ladies taking lessons to the sounds of thumping eurobeat. Beyond the final court is another of the rare surviving elements of the château, the Temple d'Amour. This monument originally stood in the Parc Monceau, but was moved to the grounds of the Château de Neuilly in 1830. It became the highlight of an 'enchanted garden', a fake wilderness that was nevertheless genuinely difficult to access (the island at this point was previously of made up of a series of smaller islands). Less than 20 years later, the château was destroyed, and its temple became truly abandoned. The temple has been designed now to offer a viewpoint, a terminus dominated by the skyscapers of La Defense. The gate though was closed, whether temporarily or permenantly I'm not sure, and I could get no nearer. The only possibility left to me was to turn around and head back on the same path. *Neuilly is the richest (according to tax declarations) of all towns in France with more than 20,000 inhabitants. Wonderful post but a sad post. I agree, fascinating and depressing in equal parts. Seem to recollect that Ile de la Jatte was at one time the most expensive place to buy property (in terms of euros per square metre). Is that still the case? It seems to have lost a bit of its lustre! Tim: Well, Sarkozy certainly had an €3 million apartment on the island (with a possibly dodgy loan from the French parliament), but it has never seemed exceptionally desirable to me - especially compared to the mansions that still exist in the town alongside the Bois de Boulogne. Yes it is sad, but it is the truth. The same destruction of the past is happening in Paris. It is time someone started talking about it. 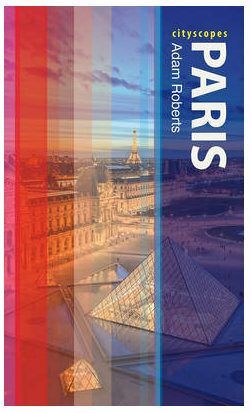 At the present rate Paris will loose a great deal of it's charm in a very short time. Sarkozy's 3 million apartment was in Francs not Euros! Marc: My mistake. Sounds like he got a bargain then in that case! On a more general note, I am not against demolition and redevelopment - if it is done well and for the right reasons. What is unusual about Neuilly is that the traces of this demolition are still visible. Although the architecture of the town has changed, the psychology of the landscape - the miniature kingdoms of those walled houses - remains the same. I'm sure this also impacts the psychology of its inhabitants too. I visited Neuilly a decade ago to find the apartment building where artist Wassily Kandinsky spent his last years (until he passed in 1944). I found the building (one of the banal structures you mention) and it had a plaque on it memorializing him. In a recent monograph (by publisher Prestel) it is stated that the apartment was preserved exactly as he left it and a photograph supposedly taken there during the mid-80's is shown to illustrate it. However, I have been unable to find any other references to the supposed preservation of the Kandinsky apartment. Do you have any information about this? Anthony: All I have found is this document which says that his widow donated the entire contents of the apartment to the Centre Pompidou. This happened in 1981, and they explain that they took possession of a large collection of furniture and objects. It is perhaps possible that someone took a photo in 1981, just before everything was transferred to the museum.